If you suffer with hypertension (high blood pressure), monitoring your blood pressure can often feel like a burden, especially if you have to collect your readings on paper. The Beurer BC58 is worn on your wrist and monitors your blood pressure accurately and quickly; it even collects your data and stores it in the Beurer HealthManager so you are able to monitor your progress and compare your results. In 2015, 26% of deaths in the UK were on account of cardiovascular disease. It’s estimated that 30% of the UK suffer with serious hypertension and are unaware of it. 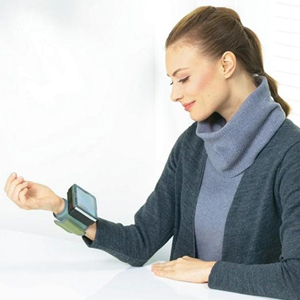 With the Beurer BC58 wrist blood pressure monitor, you can keep on top of your blood pressure; monitoring and saving your results onto the Beurer HealthManager app or PC software. A blood pressure reading of 140/90mmHg, this is considered as high and serious blood pressure or hypertension; having a high blood pressure increases the risk of strokes, kidney disease or suffering from a heart attack. This is because the high blood pressure adds unnecessary strain onto your heart and blood vessels. If you suffer with an irregular heartbeat, the Beurer BC58 can signify this with a heart symbol displayed on the easy-to-read digital display. Your blood pressure mostly depends on your health and lifestyle; if it is poor you are at more risk of having high blood pressure. So, things such as eating too much salt, drinking too much alcohol or caffeine based drinks, smoking, or not exercising enough are all factors of high blood pressure and can be controlled by changing these habits. Of those who suffer from high blood pressure, it is estimated that one third are completely unaware. Symptoms are more prominent and frequent if you suffer from extremely high blood pressure; once you have established that the following symptoms are persistent you should seek medical advice immediately. What about low blood pressure? Symptoms of low blood pressure include nausea, vomiting and fainting. To avoid these nasty events it's a good idea to monitor your blood pressure so you can get some rest and have a snack if it drops below 90/60. Be aware of your blood pressure with Beurer BC58 and the Beurer HealthManager. Why you should choose the Beurer BC58 Wrist Blood Pressure Monitor. The wrist blood pressure monitor is suitable for anyone with a wrist circumference of 14 – 19.5cm; the strap is adjustable to suit you. Many people find blood pressure monitors that are fitted around the upper arm difficult to use at home on their own; they can be difficult to position correctly, difficult to read the results and quite often can be painful during the reading. If this sounds familiar and puts you off form monitoring your own blood pressure, the Beurer BC58 Wrist Blood Pressure Monitor is ideal for you. Having the ability to record your blood pressure measurements at home will be a god-send; no one is thrilled to have to go to the doctors, many of us get nervous and feel a little stressed which alone can increase your heart rate! Monitoring your blood pressure in the comfort of your own home can make you feel at ease, and the burden is lifted. With using Beurer HealthManager app or PC software you can compare your results on a day to day basis; you could run any concerns past your Doctor with a phone call. Beurer HealthManager helps you monitor your health easily at home and can be used with a number of health monitoring devices together - it's like having your own personal physician in your home! There’s nothing more heart-warming than seeing your health improve; if you have been tackling high blood pressure for a long time but you don’t keep on track of it, how are you supposed to know if you’re improving or not? When your positive results are before your eyes, it will undoubtedly make you feel good. 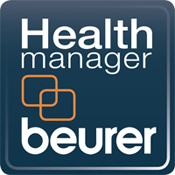 The Beurer HealthManager app and software allows you to have your data always at hand. Beurer have added graphs and tables that monitor your progress so you can get a clear overview on how you are doing, keeping you aware of where you are in your development, but most of all, Beurer have created the HealthManager to keep you motivated. Beurer are aware that motivation is vital to help you reach your goals; so when you’re feeling a little blue the HealthManager is there as a pick-you-up, updating you on your progress on a day to day basis, proving to you that even though you can’t see that you are improving, that you most definitely are. The Beurer HealthManager is a revelation to health and lifestyle changes; regulating your progress has never been more fun. Beurer have also made it easier for you to monitor your health by creating heart monitors, weighing scales and activity monitors that can be used in conjunction with one another. These devices are also compatible with the Beurer HealthManager so you can get a real and solid understanding of what is working for you to reduce your blood pressure. So, if you need to lose a few lbs because your blood pressure and heart rate is higher than normal, using the devices all together with Beurer HealthManager can be really beneficial in aiding you to reach your target. It is time to begin enjoying the satisfaction of lifestyle changes – your goal is never beyond the bounds of possibility! Lowering high blood pressure naturally without drugs or medication.